This easy project doesn�t cost a lot of money to build and it will last for years to come. Made of solid oak and oak plywood, it is much sturdier than the classic metal filing cabinet and looks so much better. You can easily finish the cabinet to match pre-existing office furniture. This filing cabinet has two locking drawers which accommodate legal size folders of 8 1/2" by 11" or 8 1/2" by 14". For added security, the top and bottom drawers are completely separated by a solid plywood middle divider. This ensures no one can gain access to the bottom drawer from the top, by removing the top drawer. 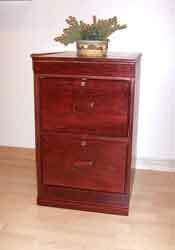 The appearance of this file cabinet can be easily altered through changes to the sides and/or drawer face. View the matching computer desk/hutch combo. Click here for more details.